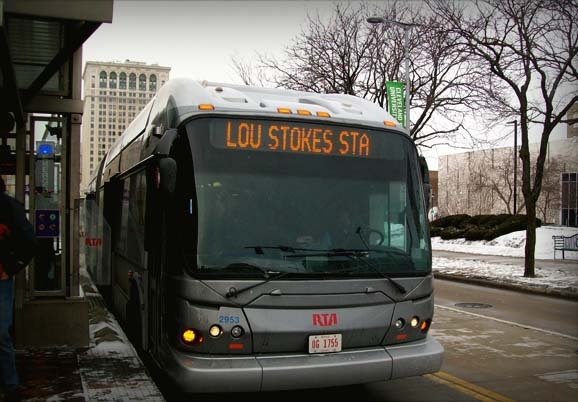 While plans for a high speed bus route between Detroit and Pontiac are still on the drawing board here in southeast Michigan, bus rapid transit is a fact of life in a number of U.S. cities, including Cleveland. 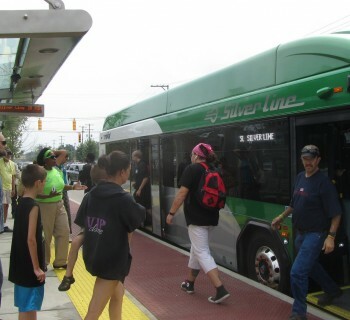 Freshwater Transit and several other area transit advocacy groups organized a trip to Cleveland to give Metro Detroiters a taste of how bus rapid transit is being implemented there. Mode Shift's David Sands went on the trip and gave the following account. CLEVELAND, Ohio--At about 8:30 Thursday morning, I hopped on a bus provided by the Detroit Bus Company and headed from the Motor City to Cleveland to get a first-hand look at that city's award-winning HealthLine bus rapid transit system. On board with me were representatives from a bunch of southeast Michigan advocacy groups, including Freshwater Transit, MOSES, Transportation Riders United, the Michigan Suburbs Alliance, citizens and political leaders interested in getting a real-life perspective on BRT. Our Detroit caravan coasted down in front of the Greater Cleveland RTA offices at about noon. We stepped inside and were treated to an informative presentation by Joseph Shaffer, GCRTA's director of engineering and project development. He gave us an overview of the RTA's 21 hybrid-electric BRT vehicle fleet, known as the HealthLine, which travels a 7.7 mile stretch of Euclid Avenue. Work on the system started in 2005 and wrapped up 2008, although plans had been in the works for many years before that. With BRT in place, travel time decreased about 12 minutes along the route from 40 to 28 minutes. Originally sized for 30,000 people, the HealthLine serves about 15,000 on a typical weekday. Service is around the clock along Euclid. Buses arrive every five minutes during peak hours and every eight-to-15 minutes during off-peak hours. The implementation of bus rapid transit varies by city. Under the Cleveland model, BRT has been embraced as a permanent infrastructure development with rail-like features as opposed to a souped-up version of traditional bus service. The HealthLine features custom-designed buses, dedicated lanes with exclusive right-of-way for the vehicles, off-board fare collection, level boarding, special traffic signals that give BRT buses priority, and three different types of specialized stations. The vehicles even feature a special guide wheels to allow for precision docking during deboarding. 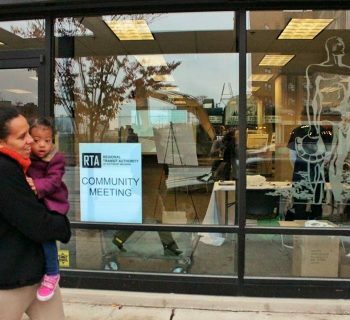 The establishment of BRT has been a boon to Cleveland in many ways. For one, investment is booming. About $4.3 billion in development has taken place along the corridor in recent years, according to the RTA. Ridership has also increased every year since the HealthLine service began. It’s now about 60 percent higher than the prior conventional bus service. Many of these new passengers are what Shaffer calls "choice riders." "By far and away the growth is by choice riders, by the so-called suit wearing people. They could ride in their car if they wanted to, but they choose to ride on the HealthLine," he said. "In addition to the obvious things about speed and convenience, the fact that the system is widely perceived of as being safe, the stations are ... very visible. They’re very well lit and the vehicles are very modern. So people view it as being safe to ride, not just desirable to ride." Following the presentation, our Detroit crew took a tour of the HealthLine system, a 7.7 mile route that travels down Cleveland's Euclid Ave. Like Detroit's Woodward Ave., Euclid is the city's historical main drag; it connects downtown Cleveland with an area known as University Circle, linking together a number of universities, hospitals and a small theater district. The bus itself was a sleek futuristic-looking vehicle with an articulated mid-section. Inside I found it comfortable and clean with room for about 100 people. As for the route, it was attractive with pleasant landscaping, medians and public art along the way. Rumble strips were placed on the road to separate the BRT’s roadway, which shared the road with car and bike lanes. During our travel, Shaffer pointed residential and business development that had sprung up over the last few years on sites that had been abandoned or in ill-repair. He also noted that the Cleveland Clinic medical center had altered designs along the route to fit the needs of the campus, subsidizing the cost of their alterations. After the tour I spoke about the BRT service with driver Doug Swain, who's been piloting Cleveland buses for 26 years. "Driving the HealthLine. It's beautiful. I enjoy it," he said. "The articulated coach actually turns corners better than any 40 footer there is, in my opinion. And it's just awesome for me, man, cause I been doing this on the line for five years straight." After the tour, we walked to the RTA's transit center where I asked a young woman named Kate Johnson, who was traveling with some friends, what she thought of the HealthLine. "It's a good ride. It's an easy ride. It's fast," she said. "I only ride when I'm going to visit a college. So we're going there so we don't have to drive. It's easier and cheaper." At this point, the Detroit caravan divided up with some returning to the Detroit Bus Company shuttle and others of us going out for an additional ride with regular Cleveland passengers. The pay machine at the station we went to was temporarily out of service, but the bus arrived more or less when a time display said it would. Once on board, I asked some everyday riders what they thought of the service. A woman named Angel was a little critical. "Too crowded," she told me. "[We] need more buses on this line. That's about it, more buses." Marcellina Fogel was more upbeat. "It's wonderful," she said. "There's one every 15 minutes. 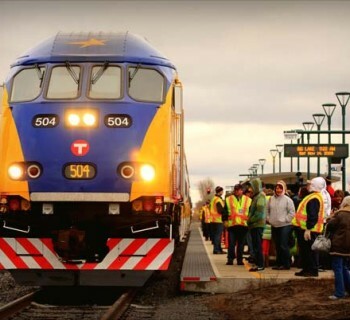 It runs more faster and gets more seats [than regular buses]." On the trip home, I spoke briefly with Hayley Roberts of Michigan Suburbs Alliance to get her thoughts on the day's travels. Her organization is committed to getting the highest possible level of BRT service when it comes to Detroit, what the Institute for Transportation and Development Policy designates as the gold standard. Roberts said she left the trip enthusiastic about the future. "In Metro Detroit ... we face [the] mindset of better transportation, world class transportation being out of reach because it's just not something we do [well] in our region,” she said, “and to know another region can overcome that perspective or that ethos and pull together and have pride as a region in building something bigger than they thought they could, it was really inspiring to know that we could do something similar in Detroit."